The NFL season begins in eight days, which is later than usual and still sooner than one realizes. We thought we'd take a look at each NFL division over the next fortnight, a scattershot glimpse that will be more updated than the magazine you grabbed before your flight but far less informative and helpful. 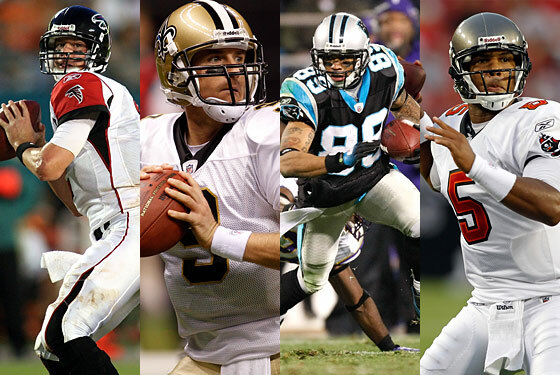 Today: the NFC South! Most important player: Matt Ryan. Person to root against: Jonathan Babineaux. Fictional organizational factoid: Chipper Jones is expected to recover in time to give Bobby Cox a chance to win one last Super Bowl. Games against NY teams: None. Most important player: Drew Brees. Person to root against: Jeremy Shockey. Fictional organizational factoid: The New Orleans Saints did not end decades of futility and bring a small measure of hope and joy to a devastated area by winning the Super Bowl last year. They didn't. Most important player: Steve Smith. Person to root against: Rae Carruth. Fictional organizational factoid: For the past two seasons, former quarterback Jake Delhomme had a special deal in which he received his paychecks from the opposing teams. Games against NY teams: Week 1, September 9, at Giants. Most important player: Cadillac Williams. Person to root against: Kellen Winslow. Fictional organizational factoid: The whole franchise is, in fact, a figment of Chris Berman's imagination, created as he stares, child-like, in to a snow globe.